Magento 2 Layered Navigation extension is a wonderful solution to optimize the product search basing on so many product attributes. The distinguished utilities of Layered Navigation module surely bring new and comfortable feelings in an efficient filter way. This means instead of wandering your online store, the customers just need to stand on the product category page and make the choice clear with the list of filter options. For example, they can find T-shirt as an expectation in color, size, material, price and other options. Guarantee that your clients are very happy when they can find and pick favorite items up faster at your store. Layered Navigation comes with the friendly interface that is fittable with every screen size regardless of devices like PC, tablet, or mobile. Magento 2 navigation is spent a neat space in the left of the product catalog page. Space is enough to store full of product attributes and free to filter. Depending on your configuration, it is possible to display characters and a list of sub-options will be hidden until customer clicks on the drop-down arrow. Moreover, there is a special point of Layered Navigation all Magento 2 stores will take, that is instant loading developed by Ajax technology. 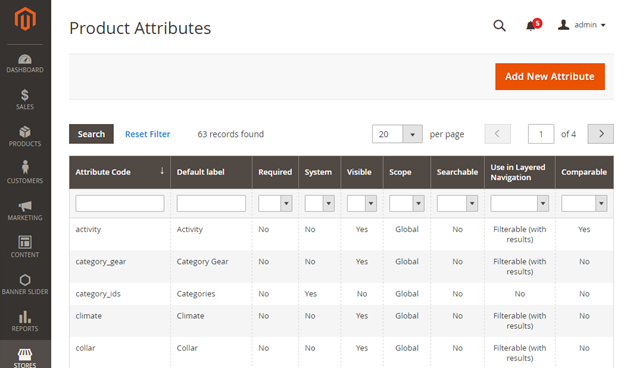 During the search progress, the stability of the current page is maintained and only part of the search results will be reloaded instantly to show the matched items. With Magento 2 Layered Navigation module, the admin configuration is totally simple. Continue reading the tutorial to enable the powerful filter tool on your online store. 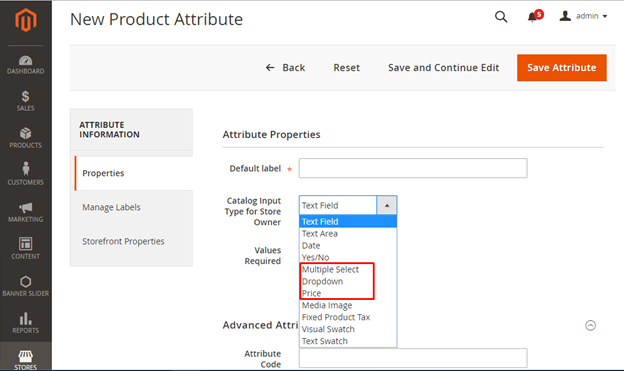 From the backend, go to Store > Attributes > Product, all existing product attributes will be listed and you can edit the allowed information when click on the responsive row in that table. Simultaneously, to add new attributes, please tap on “Add New Attribute” button on the upper right corner of the workplace. However, during the configuration, you need to take a look at 3 options: Catalog Input Type for Store Owner, Use in Layered Navigation and Use in Search Results Layered Navigation, all of which are related to layered navigation. Especially, in Catalog Input Type for Store Owner field, only accept dropdown, multiple select and price types on Magento 2 Layered Navigation. Layered Navigation Magento 2 extension comes with very simple admin configuration while your store’s navigation still runs professionally. Everything you must set is enabling the module, then all supported functionalities will be applied on the filter section. In specific, your customers can filter by multiple attributes with different values, and immediately, all results are instantly loaded on the current page. In conclusion, that is all you have to work if using Magento 2 Layered Navigation. In general, this module is the perfect way that provides an efficient way to search products as well as great experience in searching on Magento 2 stores.